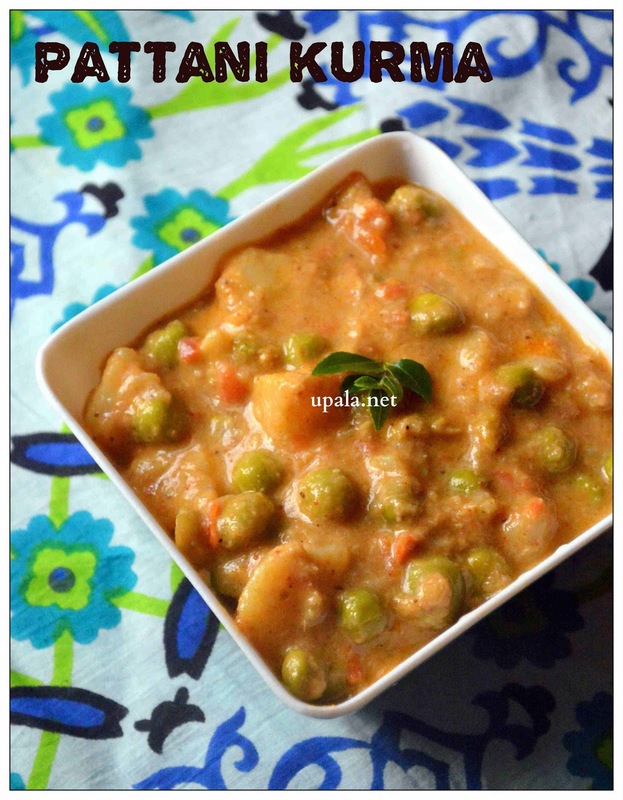 Potato peas kurma is a tasty kurma that goes well with Pori, chapathi, dosa and Idiyappam varieties. 1) Pressure cook potatoes with skin. After it cools, peel the skin and chop as cubes. 2) Heat oil in a pressure cooker and fry onions. After onions turn light brown, add Ginger Garlic paste and fry. 3) Add Tomatoes and fry till they turn mushy. Then add green peas and 1/2 cup of water. Pressure cook for 2-3 whistles. 4) After it cools, open pressure cooker and add potatoes, salt and spice powders. Start cooking the kurma in medium flame. 5) Grind the ingredients given in "To grind" to smooth paste and add this to kurma. Mix well. 6) Leave it to cook for 10 mins and switch off the flame. Tasty Pattani kurma is ready. 1) You can do the seasoning with Mustard seeds and curry leaves. 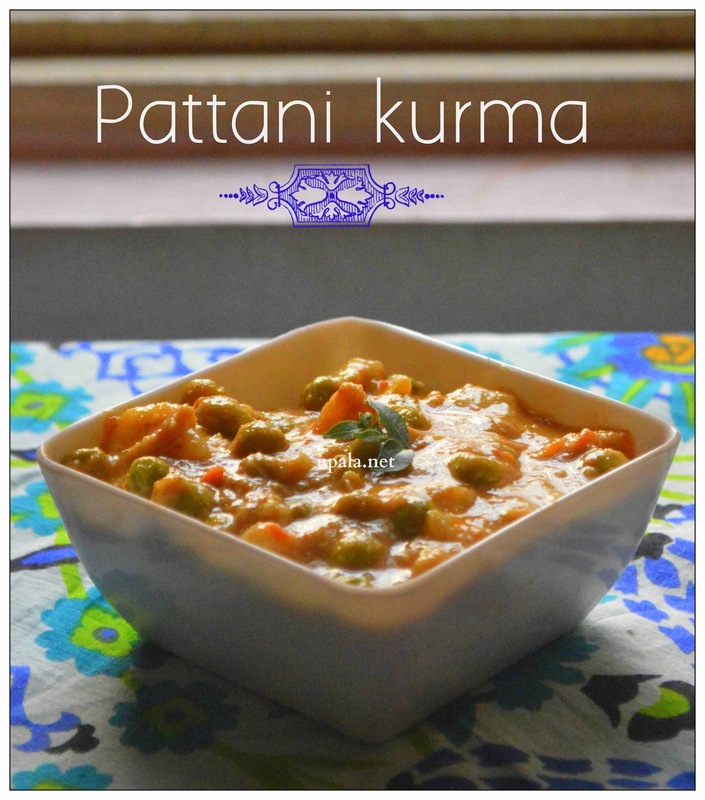 2) Garnishing this kurma with finely chopped coriander leaves gives nice flavour. 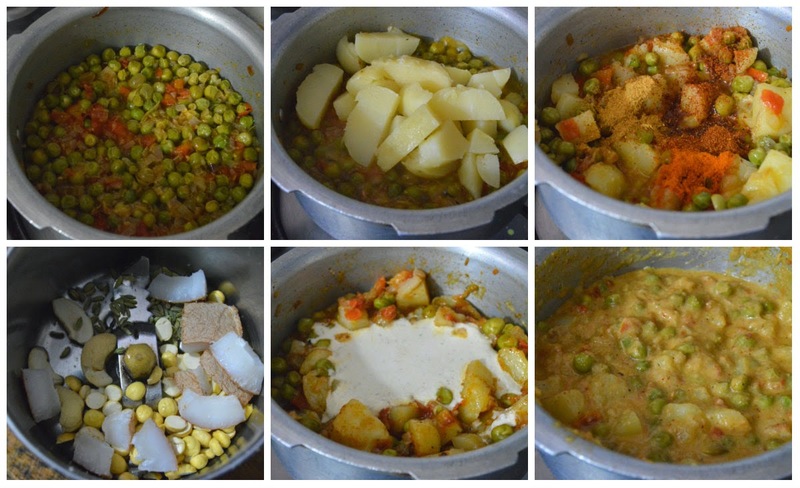 3) You can also add potatoes along with green peas while pressure cooking. Do peel the skin and cut as cubes before adding. 4) Cashews gives nice taste to kurma, you can also skip it if you don't prefer.